In an exercise, which lasted for almost 24 hours, undertaken by the joint engineering team of national carrier Air India and the MIAL, the aircraft was removed from the runway at around 9:30 pm last night. 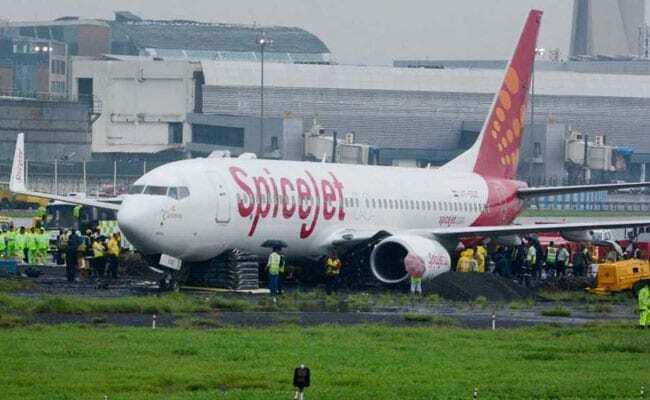 Mumbai: Aircraft movements at the main runway of the Mumbai airport was restored last night after the airport operator removed the SpiceJet aircraft which had skidded after landing amid heavy rains on Tuesday. The operations at runway 09/27 resumed at around 11:30 pm after a SpiceJet Boeing 737 plane was moved to the paved area and subsequently to a hanger, a Mumbai International Airport Limited (MIAL) official said. Minister of State for Civil Aviation Jayant Sinha had earlier tweeted, "#AI team assisting #RescueOperation in removal of #SpiceJet acft from #BOM runway, the only airline in India to offer this type of facility." Mumbai airport, the second busiest in India, has two crossing runways - 09/27 (the main) and 14/32 (the secondary runway).